Republican presidential nominee Donald J. Trump should start getting worried, because one of his worst nightmares is now hitting the campaign trail in earnest. It's already been a bad week for him, fresh off a meltdown of a first debate performance that every credible scientific poll shows he lost in the minds of the viewing public. 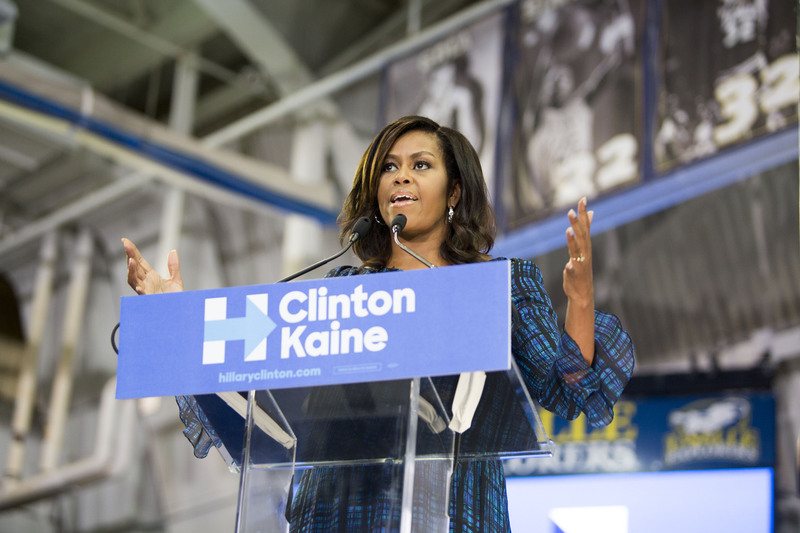 And now, he's got a whole other problem: Michelle Obama just tore Trump to shreds on the campaign trail, and she's both a cultural and political force no other Hillary Clinton surrogate can rival. Obama was in Philadelphia, at La Salle University, and as a location for a rousing get-out-the-vote event, that's an understandable pick. As it stands now, Pennsylvania looms as one of the key potential tipping-point states in the 2016 race, and it's one where the Democratic vote has prevailed in the past two cycles thanks largely to the city of Philadelphia, its black voters in particular. And, craftily and compellingly highlighting Trump's political equivalent of original sin, his years-long conspiracy theorizing about her husband's place of birth, Obama raked the real estate baron over the coals. And, in a tactic she first showed during her well-received speech at the Democratic National Convention in July, she did it all without mentioning him by name. Obama basically made two arguments against Trump as a leader. The first was the temperament argument, which looks all the more devastating just days after the first presidential debate, when Trump's insistence he had a better temperament than Clinton's drew audible laughs from the audience. "We need someone who is steady and measured," Obama said. "Because when making life or death, war or peace decisions, a president can't just pop off, or act irrationally. No, we need an adult in the White House, I guarantee you." She also delved into the personal argument against Trump, reminding the audience that the GOP nominee launched his political brand on birtherism, the collection of racist conspiracy theories intended to prove that President Obama is not a natural-born citizen, and is therefore ineligible to serve. One of Clinton's most underrated debate moments came when she called the President a man of "great dignity," who she could tell was hurt and frustrated by the attacks. And the First Lady made that case all the more powerfully. And then, of course, there are those questioned, and who continue to question for the past eight years, whether my husband was even born in this country. And let me say, hurtful, deceitful questions deliberately designed to undermine his president, questions that cannot be blamed on others, or swept under the rug by an insincere sentence uttered at a press conference. Obama went on to call Trump "erratic," and criticized him for his extemporaneous interruption during the debate that it made him "smart" to not pay any income taxes — something Trump denied having said immediately after the debate, even though a record-setting TV audience had just watched him say it. In simple terms, she carved him up like a wilting stick of butter, and did so without giving him so much as a name drop. If this is the Michelle Obama that the Clinton campaign will be depending on in the weeks to come, they're going to be very, very thrilled. If you've got the time, do yourself a favor and watch her full remarks here, because she's effective on a level rarely seen.